July 8, 2013. 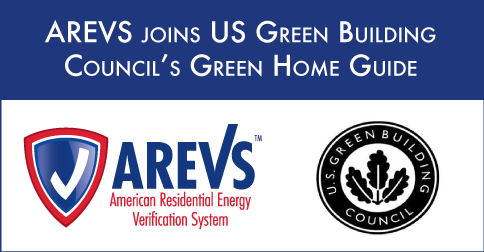 Queensbury, NY- – – AREVS: American Residential Energy Verification System announced today its inclusion in the U. S. Green Building Council’s Green Home Guide, a resource for connecting homeowners and green building professionals. AREVS’ listing in the US Green Building Council’s Green Home Guide puts us in front of homeowners and landlords looking for the best energy efficiency tools on the market,” said Dean Durst, Co-founder and CEO. “The Guide’s ‘Ask A Pro’ feature complements our ‘Homeowner Education’ resources for professionals and will help us talk to homeowners, property managers, ecobrokers, and contractors on specific points of home energy performance and efficiency. Home energy performance is increasingly a concern for the real estate and building industries as buyers, sellers, and owners take advantage of government and industry incentives to maximize home energy efficiency. The Green Home Guide connects homeowners, tenants, and landlords with home performance contractors, architects, and other professionals. trip planner Building Council” target=”_blank”>The U.S. Green Building Council is a nonprofit organization committed to a prosperous and sustainable future for our nation through cost-efficient and energy-saving green buildings. AREVS creates software and data sets for the home performance, residential real estate, and energy industries. The AREVS Home Energy Performance Calculator is the only operations-based rating tool available for the American market. It is available for licensed professionals to accurately rate energy consumption and costs based on envelope and appliance performance.